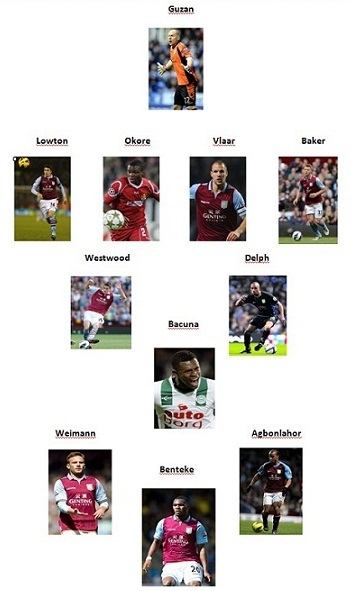 Home Lambert The Potential Aston Villa Starting XI for 2013/2014…So Far. Since his first day at Villa, Paul Lambert has been intent on making this team his own. He wasn’t (and still isn’t) afraid to make big calls, such as leaving the club’s most expensive ever player to warm his backside on the Villa Park bench. Whilst Darren Bent picked up the biggest pay cheque going in the Midlands, Lambert picked up a virtual unknown from Belgium to replace him on the pitch. That virtual unknown is now very well known, and raising an eyebrow or two of some of the biggest clubs in world football. Villa fans continue to hold their breath on Benteke, but Lambert breathes easy. In Nicklas Helenius, he has acquired a player ready to mould into our next target man should the enigmatic Belgian stay, but also ready to stand up and be counted, should he go. Last year Lambert was very brave, sticking to his guns and at times playing effectively a 4-2-4 with Weimann, N’Zogbia and Agbonlahor in behind Benteke. With the signings made, expect a more balanced but still attacking 4-3-3. From the signings so far, will these players make up Lambert’s first 11? AVFC’s Player of the Year has now established himself as no.1. Jed Steer shouldn’t be any competition but will provide able cover. Expect Given to leave. Arguably the only outfield position secured for next season. A worry is cover here though, should Lowton pick up an injury or drop his level. Perhaps one of the reasons Chris Herd is still at the club. Expect Okore to come straight into the side, that’s how highly rated he is. Will hope to strike up an understanding very quickly with the experienced Vlaar. Will be given the armband for next season with only injury denying his place. Worrying for the development of Ciaran Clark though however. Despite a tendency to dive in, his bravery and assurance impressed PL last year. Has now overtaken Clark but could move to LB to remain in the side. Luna will cover, Bennett’s in trouble. Westwood’s breakthrough season was a successful one and he will continue to keep out El Ahmadi sitting just in front of that back four. Can only get better. The only player bought outside of Lambert’s reign that has avoided the chop. Finally fulfilling his potential although Sylla will put pressure on him. Bacuna will probably take to the pace of the Premier League immediately. A box to box midfielder who could play just in front of a midfield two. Gary Gardner could also breakthrough into this role this season. His best position is still considered through the middle but he was so effective off the right last year. Could move central should Benteke leave allowing Tonev a chance to shine off the wing. Goals will forever be a problem but has become much more of a team player coming in off the flank. Needs to continue being a threat as Bacuna can also play out wide along with Tonev. Have faith. Here at MOMS we are confident he’ll give us one more year at least. If not, then we have options still with 6’5 Helenius along with the two striker-come-wingers who can comfortably play through the middle. left Back – baker – i am not sure cos i dont like see centre half in left foot.. i prefer clark in left back over baker cos he is more techincal and footballer that baker. i prefer Luna and Bennett in this roles… as u mention 3 strong team from start of season… might need more protection.. dont forget start of season can be freak result or shock defeat… play proper left back might better odd in attack solution. I think Gardner should be ready as he got full pre-season, he will hunger to prove he is still high potenital.he will fight for baunca place. as the old man said, completion and hunger is healthy to our squad..hope he play box to box or attack midfield rather defensive midfield which too defensive mind mcliesh play him. which not suit his area.. hope see him more games let alone knee injury. Delph I felt he is hit and miss for us…last 6 months he is brilliant for us… i prefer sylla over him for many reason.. he is pressure and work welll with westwood, he can go forward pressure rather pressure in our half. Bennett i will still play him in left back (2nd choice after Luna) or left winger start if we want fixed 442 all thought match he is best choice for this roles… i prefer see 3 in 1 formation, more plan rather fixed. he need time to improve his pass and marking. if he learn these he will very good player be fair. I told my friends that RB back up will be Herd for one more year cos his contract up next summer i believe… i would play him as 5th choice Centre half and 2nd choice Right Back for this season… I am not sure, his name in youth player – wilkins or watts? he is right back with potenital good full back.. I would play Carruther and Grealish to fight Tonev to push ACM and RW, in cut left wingerinside forward Roles. both is deserves try in XI or Cameo, Back up, Rotation. DJPowell1984 Some good thoughts. Would like to see more of Sylla going forward. He played the percentages at the end of last season, and Westwood also tends to favour caution, as he keeps the midfield ticking over. Hopefully, an increase in confidence gained from last season, will help them express themselves a bit more. Will be interesting to see Gardner start some games. Villa’s midfield was deeply set last season and it would be good to see a more dynamic presence in there to help drive the attack more. Last season, Villa’s three forwards had to create a lot of their own chances between them. I can definitely see a more rotation of players. Can’t see Baker being 1st choice left back. Jinksy I’d prefer a natural left-back, but if Luna doesn’t come up to speed quickly, wouldn’t be totally surprised to see Baker playing in the tough first three games, if Lambert wants to be more solid & defensive at the back. It’s an option. Weimann with Helenius and Tonev with Gabby..
DJPowell1984 I agree. He’s definitely brought players up the field to give him options in formation variation. Also, they’ll be healthy & hungry competition.